This week was full of new adventures and wonders in the pottery studio. I’ve made tumblers, plates, platters, coffee mugs, and spoons. I started with making a template for the tumblers. The inspiration for these tumblers was my new diet — making a smoothie once every morning. I did not have a ‘nice’ cup to hold my wonder elixir that I’m blending up every morning…hence, my Tumblers in clay. I made the template from a paper coffee cup that I enlarged. I traced it on heavy paper and used that as a form. 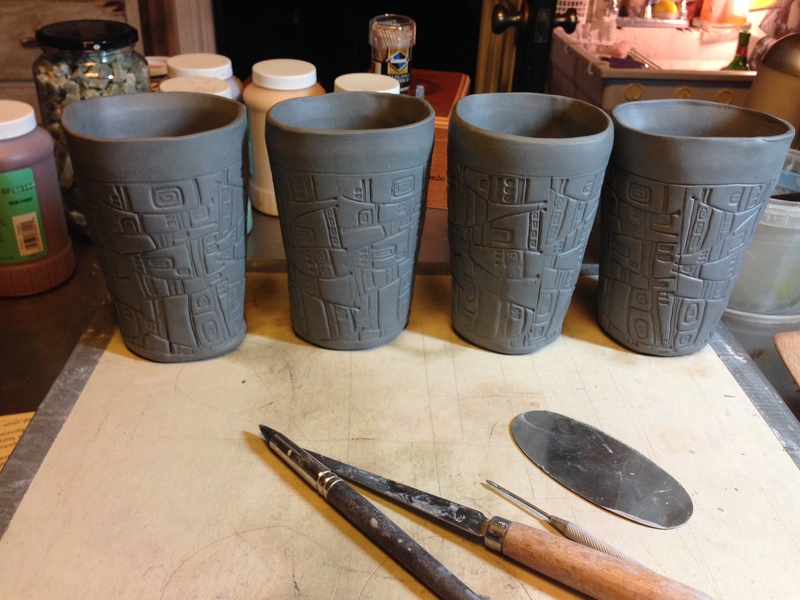 Rolling out clay about 1/4″ on the slab roller and then I rolled a design right into the tumblers……here’s a sneak peek of 4 tumblers drying (leather hard), getting ready to bisque fire…..